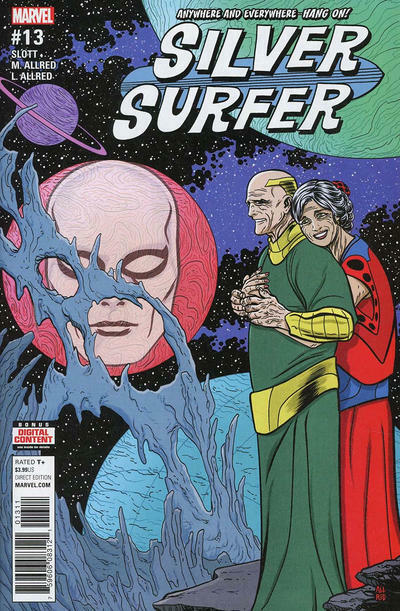 I’ve written before about how I never read Silver Surfer before Dan Slott and Mike and Laura Allred got their hands on Norrin Radd a few years back. My comics tastes tend toward the street level and the Surfer is anything but. But I gave the series a try and was rewarded time and again with some of the most nuanced, heartfelt — and certainly most romantic — comics I’ve ever read. 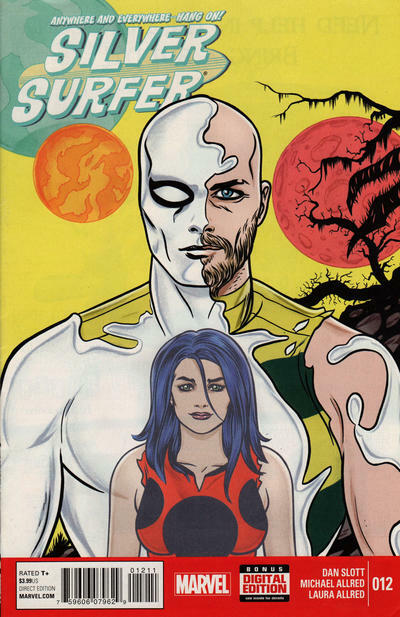 But Silver Surfer is over now, and with it the journey of Norrin and Dawn Greenwood, the sensational character find of 2014. 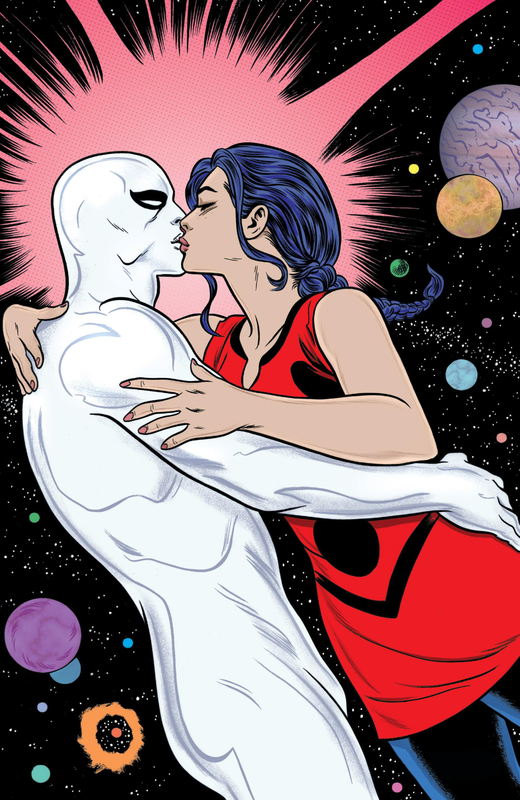 There were many brilliant twists and turns along the way — literally with the Eisner-winning Silver Surfer #11 from the series’ first volume — culminating in the wonderfully meaningful revelation that Dawn herself was transformed into the Kirby Krackle that has surrounded the Surfer since the beginning. Beautiful and poignant. That was Silver Surfer. Dan Greenfield: You and Dan were credited as “storytellers” as opposed to writer and artist. Describe how your collaboration evolved over time. Mike Allred: Early on, we talked about the overall epic arc. Then we’d usually have a lengthy phone conversation, which pretty much amounted to Dan in “storytelling mode” where he’d just start talking everything out, even doing voices and sound effects! Then I’d get a relatively tight outline with page breakdowns, and a good gist of what was being said between characters. I’d jump on it and draw everything out, encouraged to play with it to my heart’s content. Then Dan would take what I did and do a final script. It was always a big kick to see how the final published issue would sing, given how Dan would pull it all together. 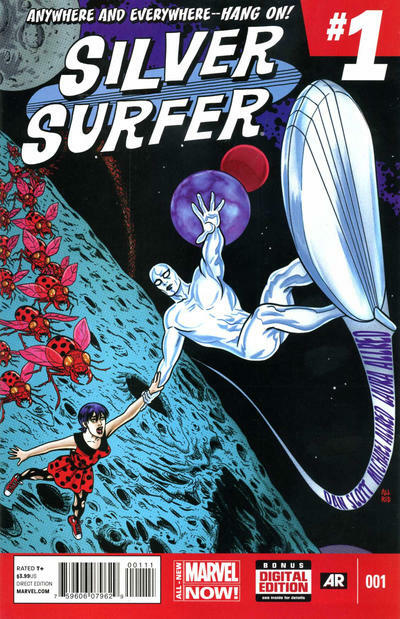 Greenfield: Were you a big Silver Surfer fan before this series? What do you consider the one story all readers should read? Allred: CRAZY BIG FAN! Silver Surfer is one of my all-time, lifelong favorite characters. 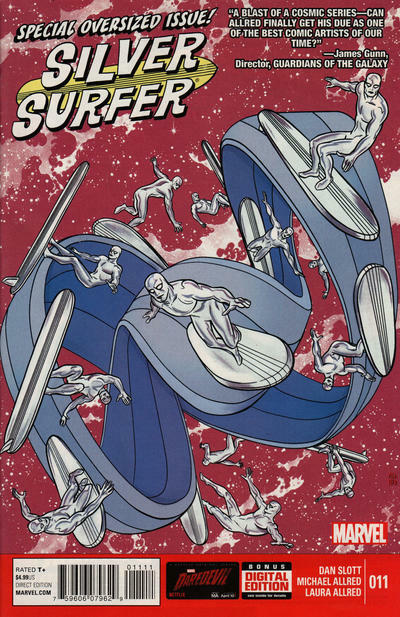 Whether surfing in the ocean or skateboarding as a kid, I always pretended I was Silver Surfer. The coolest! Surfer, not me, obviously. That’s about as nerdy as its gets. But it set my imagination on fire. Greenfield: Tell us one case where you were blown away by an idea Dan had. Allred: Well, the biggest mind-blower was the Mobius loop. He actually had to send me photos of diagrams on a white board for me to even begin to understand what he was trying to communicate to me. But once it clicked in my brain, I set out to make it work. My favorite contribution to that one was coming up with the subtle arrow-shaped panels. Greenfield: Tell us one case where Dan was blown away by an idea you had. Allred: Me, a mere mortal? Can’t say that ever happened. Maybe Dawn’s polka-dot outfit? That certainly became something significant. Not blown away, such humble beginnings, but it seemed like every little contribution I may have had inspired Dan to take it to cosmic levels. Greenfield: The series’ most famous issue was, as mentioned before, Vol. 1, #11 — the Mobius strip story. But in the end, the entire series was more or less a Mobius strip (if such a thing can be “more or less”). When did it become clear that this is where things were headed? Allred: Pretty early on. We were all nuts for Dawn and her “Miyazaki -ness.” And we wanted to make sure that when we finished our run that her story was completely told. We set out from Day One to tell a story seeded with callbacks that would reward readers when reread. Greenfield: Now fess up: Is Reg supposed to be Dan? Allred: Just a sec, my lawyer is whispering something in my ear. No. Reg is not Dan. Any similarities to any person or persons living or dead is purely coincidental. Greenfield: Readers’ connection to this series was deeper than most. Were you surprised by this outpouring? Allred: Oh yeah. We all create with the hopes that the work will move and inspire, but the reactions we got here were off the charts. Greenfield: The two of you invented a lot of worlds for this series, some of the most charming I’ve ever seen in comics. Where did some of those come from? Allred: Who can say? A monthly schedule leaves little time to reflect. A word, a phrase, even a song, would often put ideas and images in my head. 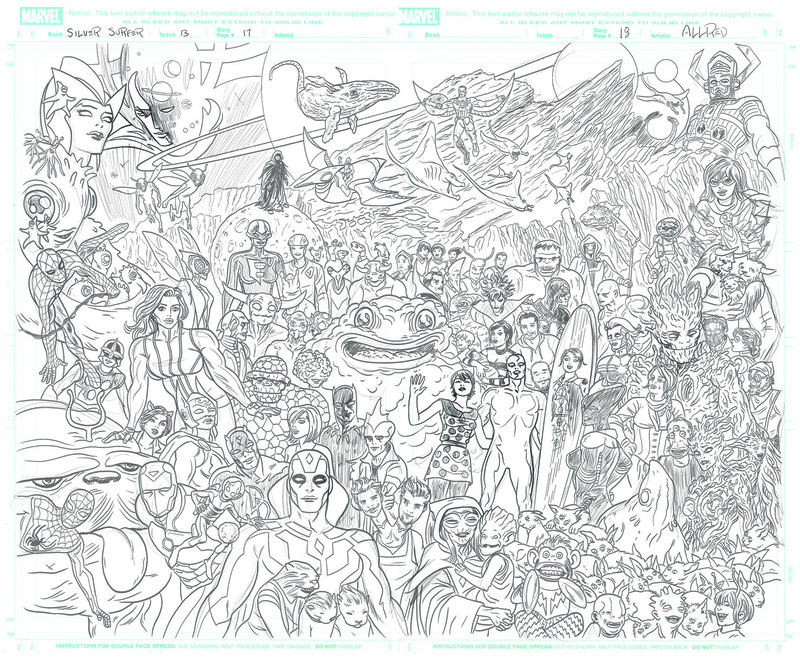 Obviously, there were direct requirements based on what Dan had come up with, but often I’d design aliens directly on the page with no time to rethink or rework ’em, just hoping everyone would dig what I came up with. Greenfield: Was there anything you left on the table, anything you wanted to do but couldn’t? Allred: Not until this very moment. We gave our alls. But now with a little reflection, it would have been nice to have Norrin and Dawn go on a double-date night with Reed and Sue. Greenfield: You guys packed in a lot over the last few years. What are your own favorite parts of the series? Allred: Wow, that’s the toughest question. I love it all so much. Dan, and our editor Tom Brevoort, who put it all together, will forever have huge chunks of our hearts for every wonderful thing this project brought. Hours at the drawing table felt like fleeting moments. 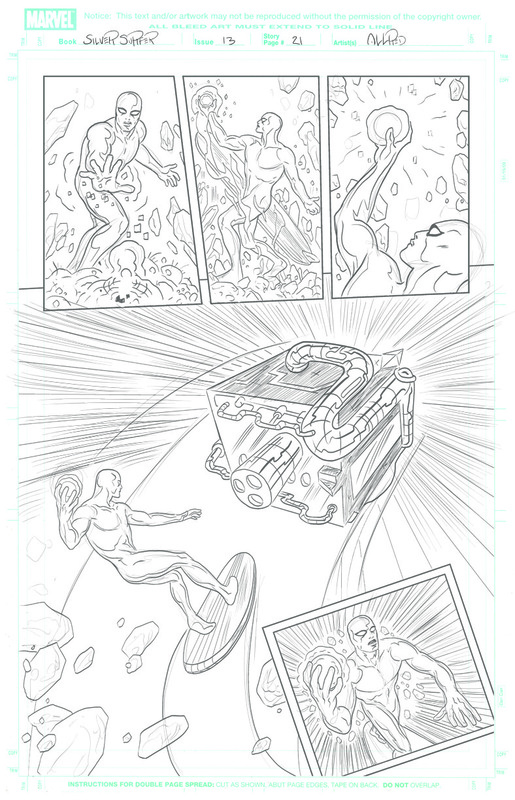 I can say having the Silver Surfer ride a moon into Galactus provided some of the biggest thrills I’ve ever shared with my pencil. This was a wonderful series. Thanks . Everything about this series was a delight. Congratulations and thank you. This series was an improvement over the first series by Lee and Buscema whose Surfer tended to moan over the human condition.